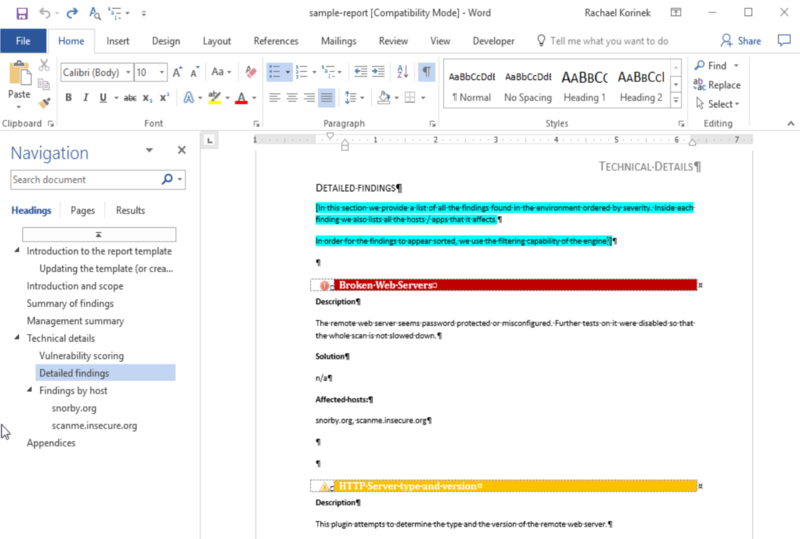 Convert a sample Word report into a Dradis template. In this guide we cover everything you need to do to convert a sample Word report into a Dradis template. Make sure you have the Developer Tab enabled on your instance of Word. Consider saving your .docx Word file as a .docm file with macros enabled so that you can add macros like the UpdateAllFields macro. 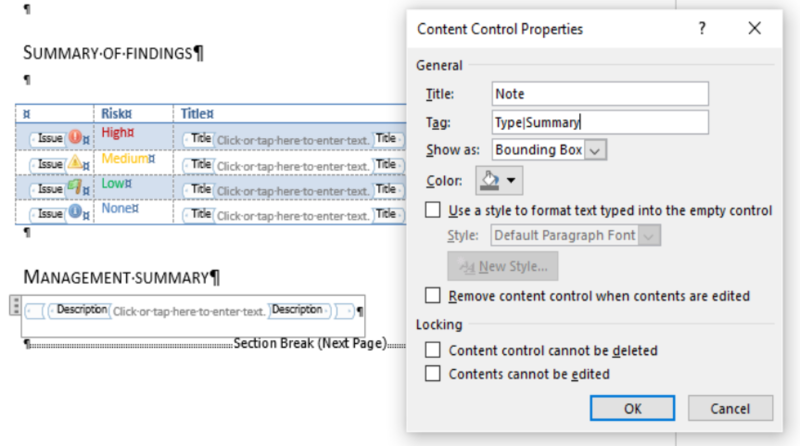 If you have a Table of Contents, you do not need to do anything special with it to include it in your Dradis template. Just consider adding the UpdateAllFields macro to your template so that the Table of Contents is updated after export. Create a new (blank) Dradis project. 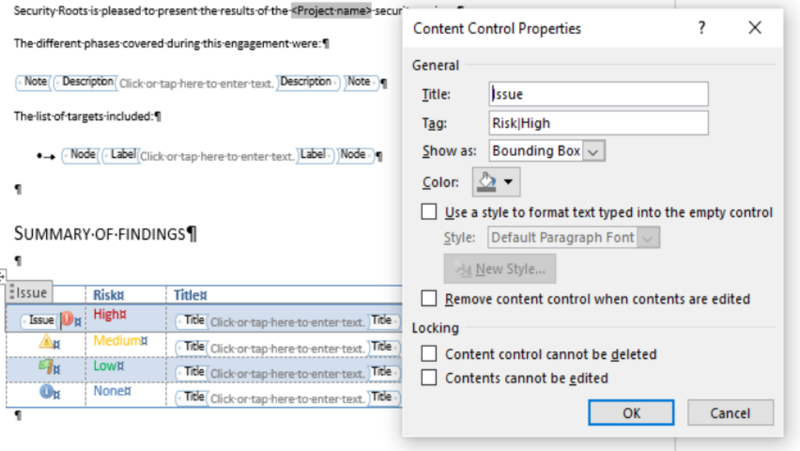 As you complete the sections below, add the relevant content (Notes, Issues, etc) to your Dradis project right away so that you can test the template and catch any problems. 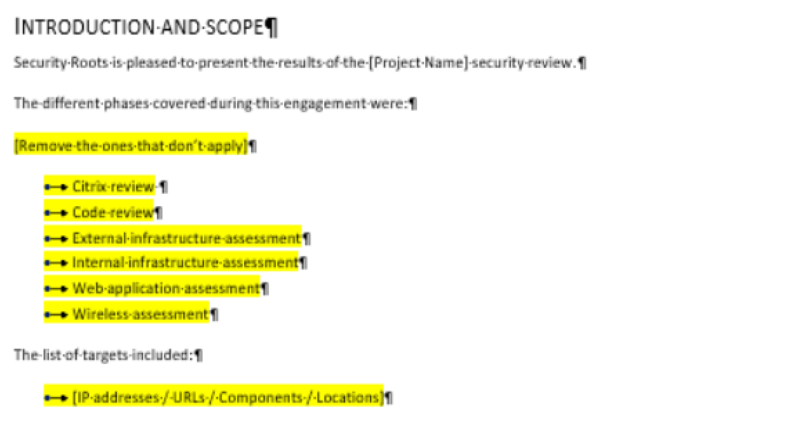 Add document properties when you have project-specific details that are repeated multiple times throughout the report (e.g. Client Name) or don't make sense to add as a separate Note (e.g. Project Title). After adding the document properties to your template and Dradis project, make sure to run a quick test export! If you get an error message, check out the Failed export page of our Debugging your template guide for more details. Learn how to use Note content controls to extract information from your Dradis notes and include it anywhere in the report including the Executive Summary or Scoping sections. Build a Summary of Findings table using the information from the Issues in your project. We replaced the placeholder engagement phase content with a Note content control that we filtered by Type|Scope. 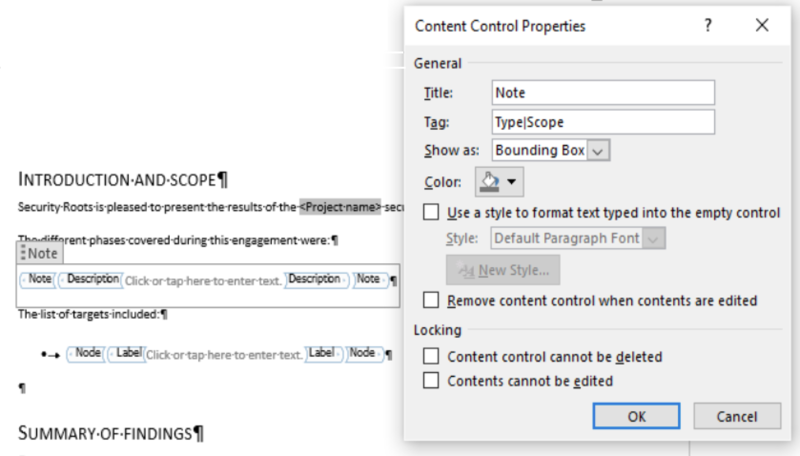 So, any content that we put in our Dradis project inside the Description field of the Note with a Type field value of Scope will export into this section of the report. We also added a Node Label content control so that a list of every affected host in our project will export here in the report. To create the Summary of Findings table, we'll be including the information from the Issues in the project rather than pulling from Notes. The detailed findings section in this case is also organized by risk rating with High-risk Issues appearing first. What we need to do is convert this sample Issue into a template Issue for other High-risk Issues using content controls. We replaced the example Issue Title with the Title control, replaced the sample description with the Description control, and replaced the example solution with the Solution control. We also added in the magical Affected control in the place of the sample affected hosts. Finally, we wrapped all of these controls inside the Issue control before filtering it by Risk|High. Repeat this process for every differently-filtered Issue in the project (e.g. Risk|Medium, Risk|Low, etc. 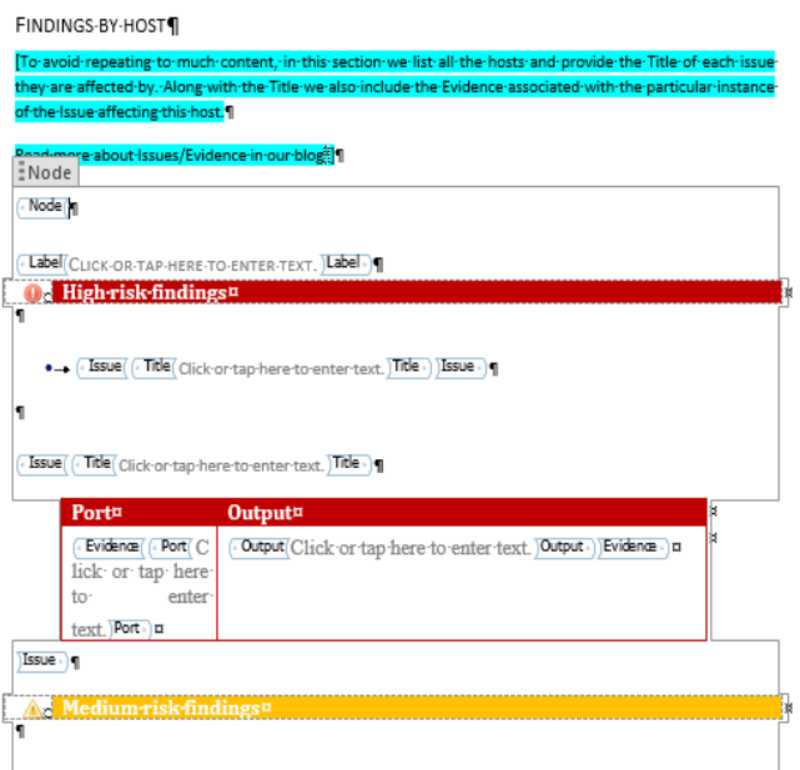 Provide a list of findings that affect this host, sorted by severity. For each affected host in the project, we want to see a list of the Issues and the relevant Evidence for each of those Issues. This is going to require nesting a few controls but is actually not as complicated as it may sound. The first Issue control will output a bulleted list of all of the High-risk Issues associated with this affected Host. 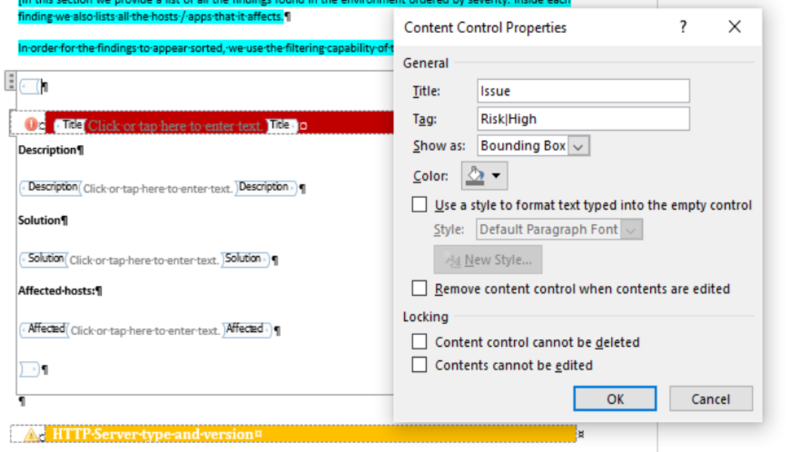 We've seen this before, the Title field is wrapped with an Issue control that is filtered by Risk|High. Below in the table, we're adding Evidence to the mix. First we added the Port and Output controls to the table cells, then we wrapped the entire table row in an Evidence control. And finally, we wrapped the entire table in an Issue control, filtered as always by Risk|High. But wait, don't we want to group these by host? Yes! In order to get these Issues organized by host, we'll need to wrap the entire repeated section in a Node control. First, we added the Issue and Evidence controls for the other Risk ratings, and added a Node Label control as well. Add a table of open services (straight from the Nmap plugin), and apply a custom style to it. To add the Services table to your report, first you have to decide whether you want to pull in the Services table from the Node properties or from the Host Note. In most cases, we recommend using the Node properties but if you need to apply a custom table style to your Services table, then you should pull the Services table from the Host Note. 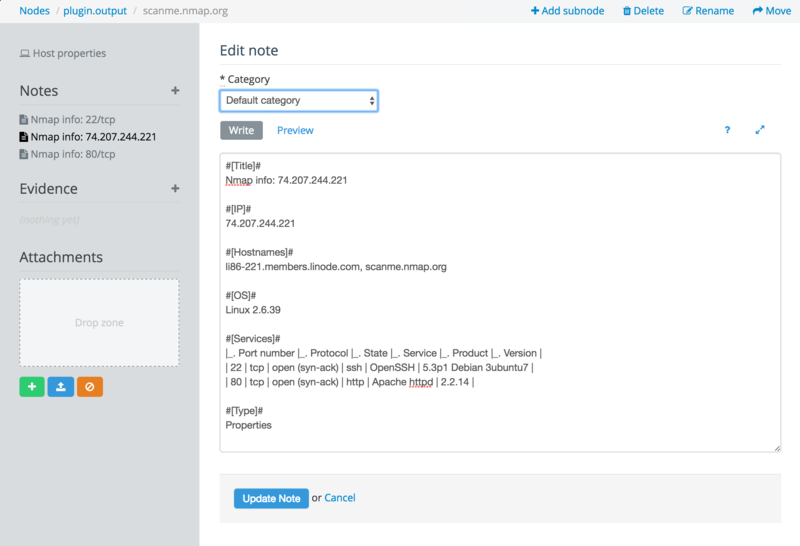 You can change the fields and formatting of the Host or Port Notes within the Plugin Manager. Head over to Dradis::Plugins::Nmap within the Plugin Manager and select the Host or the Port template. You cannot customize the format or content of the Node properties within the Plugin Manager. To include the Sercices table from the Node properties in our sample report, we would need to add in the following content controls. 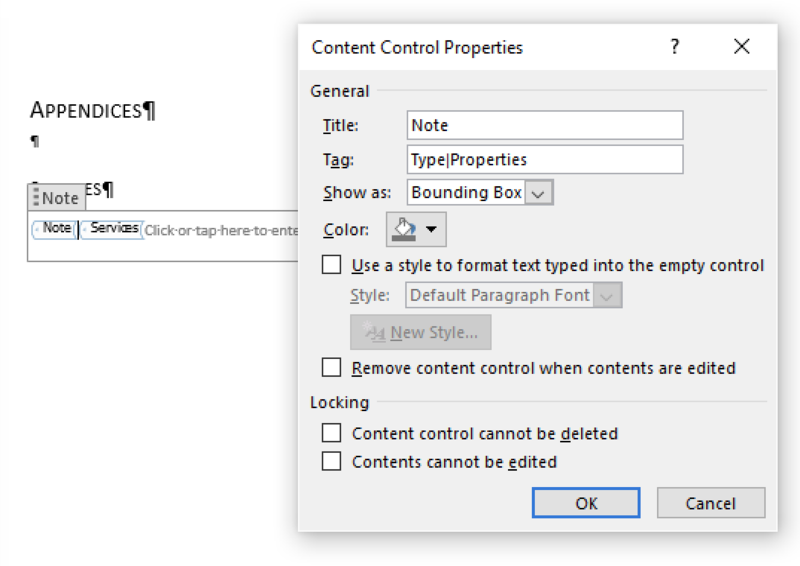 Remember, you need to use the Node properties capitalization in the content controls. If you want to pull in the content from the Host Note instead, first you will need to make sure that the Note is set to the correct category. The Notes from Nmap will automatically be imported using the Default category. In order to include them in our Word report, we need to make sure they are set to the AdvancedWordExport ready category. 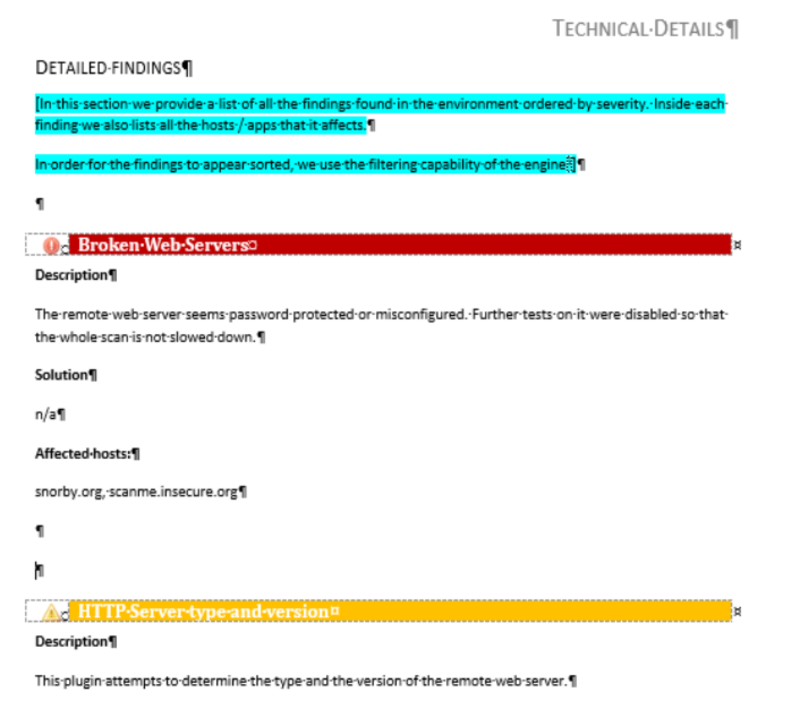 Contact our support team if you need to change the categorization for Nmap Notes. After setting the Category to AdvancedWordExport ready, we'll need to add fields like the following to our report template. 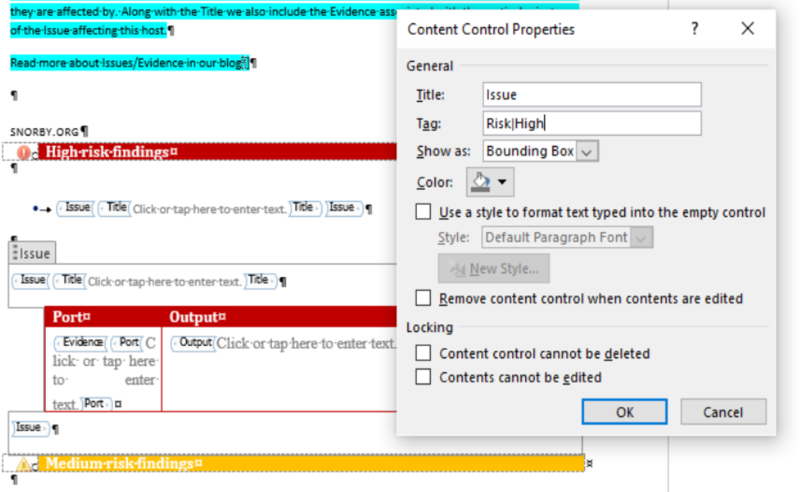 See the Note content control page for more detailed instructions. Make sure to define a #[Type]# field within the Plugin Manager so that you can filter by that field value in your report template. Are you creating tables within Dradis and want them to export into your report with some custom formatting? Check out the instructions on the Custom Tables page of this guide. 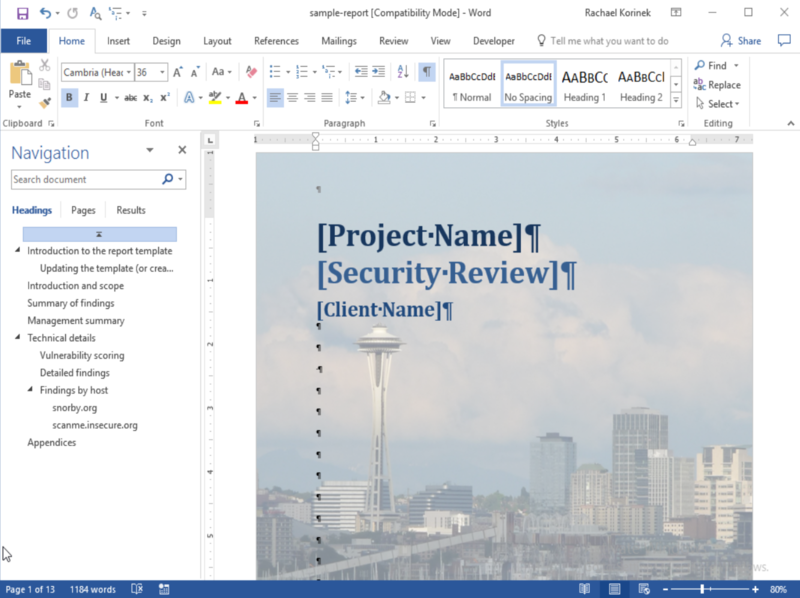 Add screenshots to your reports and add captions to those screenshots using the instructions in the Screenshots and Captions section of the Text Styles and Screenshots page of this guide. 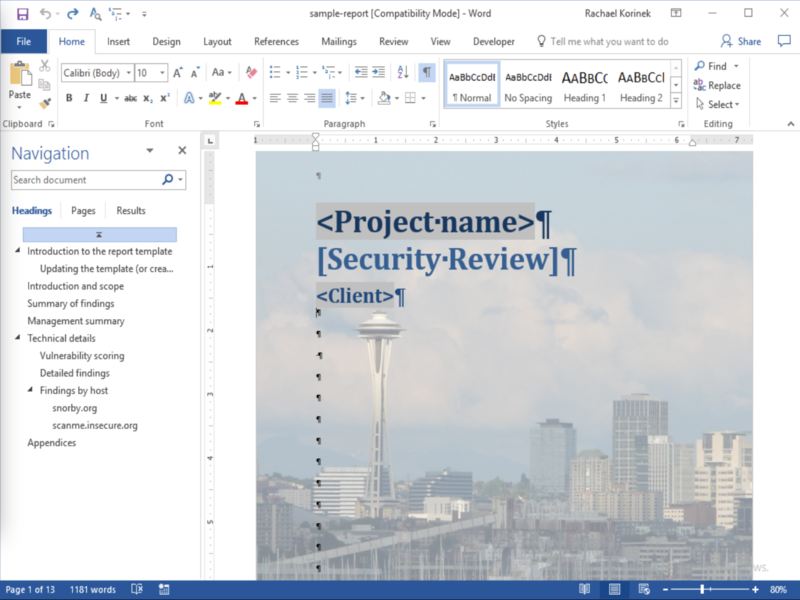 Don't forget to add the Code style to your report template. See more details on the Code Blocks page of this guide.